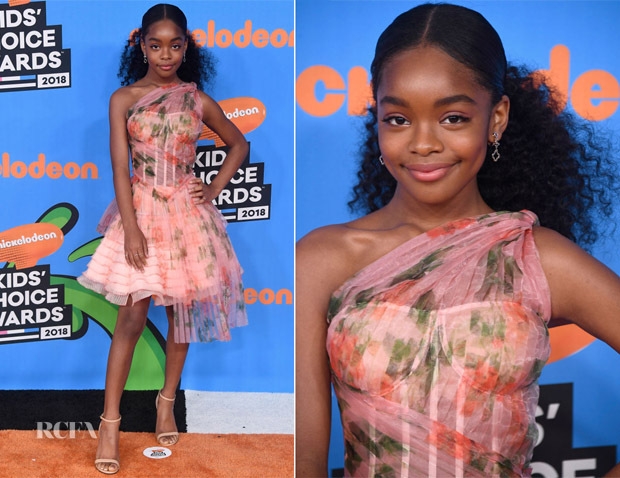 Marsai Martin was a breath of fresh, spring air at the Nickelodeon 2018 Kids’ Choice Awards on Saturday (March 24) in Inglewood, California. The ‘Black-ish’ starlet had a princess moment of her own in this Alexander McQueen Spring 2018 floral frock. While the exposed corsetry could have been interpreted as a bit mature for the 13-year-old, I think it was the sweet overlay of floral chiffon and the pouf skirt, not to mention the rosy colour palette, that downplayed that element and ensured plenty of girlish charm. Loriblu sandals and Be My Lilou earrings rounded out the darling look.